“…the idea that it’s wrong or rude to speak Irish is something I hear quite a lot. On a personal level, I made a choice to speak Irish wherever I could about eight years ago. I wasn’t brought up through Irish but I was speaking it more and more with friends. With this decision came an unexpected fear for me; what will people think if I speak Irish publicly? I spoke it in my personal life all the time, but what about asking for services or seeking advice in Irish that are supposed to be available in Irish? Under the Official Languages Act, the library, the Revenue Commissioners, the Gardaí and hundreds of other services are supposed to be available through Irish. To my surprise, most people are very welcoming; they understand you are just trying to speak your national language. Unfortunately, this isn’t always the case. Sometimes people will say I’m rude, arrogant or that I’m just trying to be smart. Interestingly enough every single person who says this to me is Irish themselves. I’ve never really had negative feedback from people of other nationalities; most of them have their own languages, and they understand that there’s nothing wrong with speaking your language in your own country. Which is complete and utter nonsense. Corporal punishment has been banned in Irish schools since 1982 and has been a criminal offence since 1996. No one under the age of forty has ever experienced any type of physical chastisement in a school in Ireland, and if they have done so they should be in the High Court seeking damages from the institution concerned and the department of education. Except that in this case the claim is literally true. Put aside the determining historical factors of foreign invasion and occupation, colonisation and annexation. Gloss over, for one moment, the effects of externally-imposed ethnocide and linguicide. Let us focus instead on the school system alone, as introduced into Ireland by the British authorities in the early 19th century. The primary – and avowed – purpose of the National Education Act of 1831 was to make good English children of bad Irish children, and one of the primary mechanisms of that forced conversion was the removal of their native language. By stripping the younger generation of their identity Britain’s colonial rule on this island nation could be made more effective – and enduring – than anything achieved through fire and sword, plantation and displacement. Consequently the sole and only language of education in the National Schools was English. However, the British did not act alone in this grand scheme of linguistic homicide. The Roman Catholic Church, and in truth, some parents, willingly cooperated with the foreign authorities in Dublin and London, each for their own reasons. The church hierarchy in the 1800s (and much, much later) saw Ireland as a backdoor to the United Kingdom and its empire; a Catholic salient in the Protestant bastion which could be used to bring England back into harmony with Rome. The indigenous language and culture of the Irish was an impediment to that great task which needed to be overcome. The peasantry on the other hand saw English as the language of government, of law and order, of food on the table and a roof over one’s head. To speak English was to become English. It was to gain acceptance as a master not as a figurative slave. For the same reasons that Roman Catholics converted to the Protestant faiths in the Great Famine of 1845-52, to simply survive, so too did the native Irish slowly and forcibly abandon their nationality as it had been known for millennia. That is when the beatings took place in the schools in Ireland. Throughout the 19th century and into the early 20th, school children were forbidden to speak in their mother tongue. 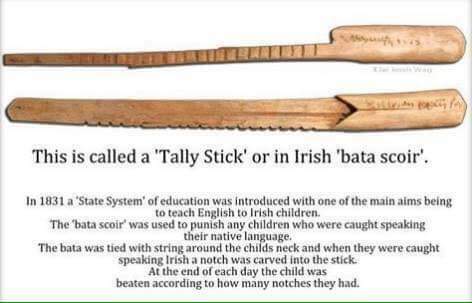 If caught speaking Irish, reported by the teachers or informed on by fellow pupils, they would have a stick hung around their neck, the feared bata scóir or “tally stick”, into which notches were carved every time they were discovered to be speaking the forbidden language. At the end of the day or the week they were beaten in accordance with the number of notches on the tally stick, by the staff or by their parents. In some cases the local priest or Protestant minister would be informed so that the family could be privately or publicly chastised. And the beatings were horrific. Whip-like canes or knotted ropes were used as the child was held down by one or more adults depending on their age or willingness to fight back. In the case of the schools these punishments were often carried out in front of their classmates as an example to others. So don’t talk to me of the Irish language being beaten into the people of Ireland when the English language was tortured into us by an alien church and state! It is time to get angry! Yow! And I thought I had it rough during my two years in Catholic school during junior high, where, in fact, I did get literally get English beaten into me on more than one occasion. The way Irish history is edited and half-truthed by the Irish themselves is incredible. The shame about the tally stick, the deep cultural aversion to even acknowledging its former existence, says much about my nation’s collective psychology. Well said. We might be the only people on the planet who hate ourselves more than our enemies ever did. Exactly. The Super Colonised Irish. Indeed. The Broken Harp was one of the biggest influences on my thinking that I’ve ever read. I’ve been meaning to read Mac Siomoins other works ever since. English is an international language that is spoken as a lingua franca by over 1.5 billion people and we have too accept that as fact. A Church of Ireland campaign to promote worship and religion in Irish was started in 1914 with the founding of Cumann Gaelach na hEaglaise and Douglas Hyde who was a Church of Ireland member himself learned Irish from native speakers and became a scholar of the Irish language. Many parents who knew that emigration was the only option discouraged the Irish language been spoken by their children. Historians have remarked that the fact that many Irish emigrants to America where fluent in English and it gave the Irish a marked economic and political advantage over other nationalities beyond their numbers. In the late 19th century Russian was the only language that was allowed in schools in the Russian Empire. And kids who broke that rule had to wear a medal like this until they ratted out some other kid that spoke their own language. Imperialists and colonists indeed think alike. And do they really not teach about those tally sticks at school here? In Latvia the existence of those medals is common knowledge. A very similar system was used in Wales. However it´s been pointed out that such practices could only have been carried out with the tacit agreement of the parents. However the problem I have is why, in the modern world, where at least in Europe outwith the UK and Ireland most people speak English AND their native language, there should be this ¨either or¨ attitude. The idea that to speak English you have to abandon Irish etc. This is clearly an old colonial attitude. How many generations is it going to take to get over it? Whoops! For ¨naive¨ please read ¨native¨ faulty keyboard and not picked up by the spellchecker. No insult intended to anyone. But nowadays most of the Irish people don’t even have that “or” option. They are taught English right after they’re born by their parents and relatives. Irish for them is just a difficult foreign language with little practical purpose. Why did those parents support that practice? If you think that your kids deserve a beating for speaking a particular lamguage, why teach it to them in the first place? Teach them English right away and avoid all that trouble. In most cases the parents were monolingual Irish-speakers with – at best – a few words of English to allow them to deal with British officialdom. They would speak Irish to themselves and initially to their children but later send them to school to learn to speak English. Accounts of parents refusing to speak to their own school-going children beyond a few halting words of English for fear of them not learning the language, or children teaching their parents in turn how to to speak English are legion. Some make for terrible, emotional reading when you understand the circumstances. The savagery, the damage it did to peoples’ minds, to families and communities is beyond comprehension. Generations were born in Ireland who became deeply damaged adults. It explains an awful lot about us. Right to the present day. That all sounds so bizarre? Why not simply learn 2 languages? Just like most of Europe? Clearly it makes no sense from your POV. In places like Ireland, Wales, the Scottish Highlands, but also Lower Brittany (so it wasn´t entirely an UK/English language thing) people somehow came to feel that their native language was inferior, the mark of a second-class citizen and an obstacle to social progress. But quite why and how the idea arose that speaking Irish (etc.) meant you couldn´t also speak good English, is a puzzle. Certainly worthy of study. Possibly it was simply due to the Imperial Power disliking and being suspicious of the native speech. This attitude is still very common among English monoglots unfortunately. So – was there a desire to ‘fit in’? Did they want to be perceived to be the same as the English or what? But their other actions weren’t really consistent with this. They kept their religion and tried to secede from the UK. Most of them don’t like to be called Brits. And they weren’t perceived as equals in the USA and other English speaking countries anyway. Not to mention all the mess that happened in Northern Ireland. So what was the point of throwing Irish away again? It should not be a puzzle. It is the result of a carefully orchestrated program carried out by imperialist colonisers: destroy the aboriginal cultures and convert them into proper Englishmen (Insert name of imperialist power here). I often think that the worst thing that most Irish do is assume that what is going on with language in Ireland is a unique Irish problem. No. It is / was / will continue wherever colonisers wish to dominate another culture. The economic nature of Imperialism in the present world notwithstanding, this is the exact same place where literally THOUSANDS of aboriginal languages in North America stand right now. The language was beat out of the speakers, mostly children. The children were forced into residential schools to further sever the emotional and cultural ties with their parents and communities. In North America, most aboriginal languages have been brought to their knees or become extinct within 400 years. In Ireland, it has been going on for 800 years. It is amazing anyone still speaks Irish. sylvaingrandcerf – yes, that’s absolutely true. Other colonisers also tried to eradicate native cultures. As I mentioned before – my own nation was affected by similar programs as well for centuries. Even nowadays you can meet arrogant Russian imperialists who act as if Latvia was still part of the Russian Empire and that everyone there must speak Russian. And for some reason many lefties who cry about colonialism in Africa and America don’t say anything about countries like mine or if they do they side with the Russians and say that WE oppress them. But in the Irish case – they actually weren’t converted into proper Englishmen. That nation now resembles something like the Frankenstein monster that is disliked even by its creator. They pretend that they’re a bilingual nation, but speak only English. They emphasise that they’re a totally separate nation from the English and the Brits, but at the same time copy most things from them and don’t treat British citizens as foreigners. They want to be a separate country from the UK, but at the same time be as similar to it as possible. And the Irish in England also historically weren’t perceived as equals – they were ridiculed by magazines like Punch and companies who looked for workers said that “no Irish need apply”. That last point is all too accurate, Jānis. Irish MEP Liadh Ní Riada has warned the Irish government to actively ensure the EU does not lose English as one of its official languages. As a fluent Irish speaker and advocate of the language, Ní Riada believes we must still ensure English is available in the EU for those in Ireland who consider English their official language and who speak only English. Full of contradictions? Not necessarily. The case is also being made on behalf of Malta. In addition 1.8 million EU citizens will continue to live outside its borders, but as an indigenous population, in terms of people in the north-east of Ireland. And they have no ready access to Irish education, services, etc and so default to English. Where’s the contradiction? It’s not an either/or question: her first language and language of choice is Irish but for most of her constituents it’s English. Thankfully her second language is English, so she can communicate with them.